If you grow wine grapes in the northern hemisphere you should finish up pruning in the next month or so, depending upon your growing conditions. If you have a vineyard in the Napa Valley (or Northern California) you better finish up NOW! 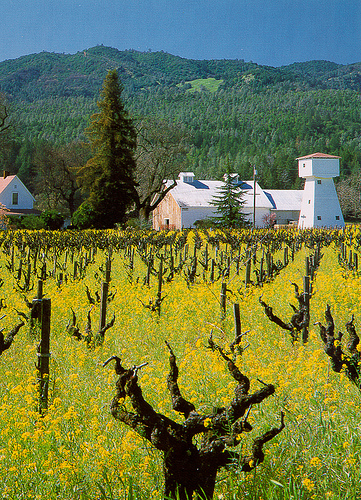 The annual growth cycle of a vineyard resembles that of a rose garden. After a spring, summer and fall of producing their little hearts out these plants deserve, and take, a rest. Depending upon the weather, the vines drop their leaves and go dormant sometime in November or December – just like roses. Frankly, they look like dead stumps right now. But, we’re thinking the vines may well wake up early, in this neck of the woods, this year. After a summer of no summer in 2011 we’re experiencing a very pleasant (but somewhat scary) winter of no winter here. It’s been warm and dry for the most part. Today is supposed to top 75 degrees frevvinsake! On a normal year, we figure the vines will come out of dormancy beginning in about mid-March. But, the soil warms up fast when it’s dry and it could well be that the vines are thinking about stirring and, maybe, waking a few weeks early. A few weeks can’t possibly matter, you say! Well… it depends. The thing is that we can have frost at night here into May and the earlier the vines wake up the greater the risk of frost damage. Last year, the spring was so wet and weepy that we didn’t have any frost problems at all. But 2008 was the worst year for frost since 1972! Can you say crop loss? Not to mention sleep deprivation! If we come through the spring without any frost damage, all in all, early “bud break” (the emergence of new shoots) can work to our advantage. Early bud break often means early flowering, early fruitset and early harvest. Which means we may escape rain damage on the other end of the season.